Smoked Hamachi Crudo — Eat a Duck I Must! We very rarely get to leave the house together (without Baby Duck) these days, let alone go on a date. But for our third anniversary we were lucky enough to have Mama Zhao happily agreeing to babysit for us while we celebrated (promising to return as quickly as possible!). Seizing this rare opportunity, Jared booked us an early bird/senior citizen 5:15 reservation at GT Fish & Oyster, one of the newest restaurants in town specializing in seafood. We'd been hearing quite a lot about Giuseppe Tentori's new restaurant venture and thought this was the perfect time to go. Plus, we can't say no to good seafood. Normally we like to check out restaurants with a small group so we could order pretty much everything on the menu. But seeing that this was supposed to be a romantic date, it probably would have made for some awkward conversation, yeah? Nonetheless, we did the best we could to cover the menu and started off with 3 pairs of oysters. We were at first a little sad that they didn't have our favorite kumamoto oysters we saw on a previous menu, but we were completely floored by the Lady Chatterly oysters. So much so, that we ordered 4 more. We also absolutely loved the ponzu mignonette that came with it. 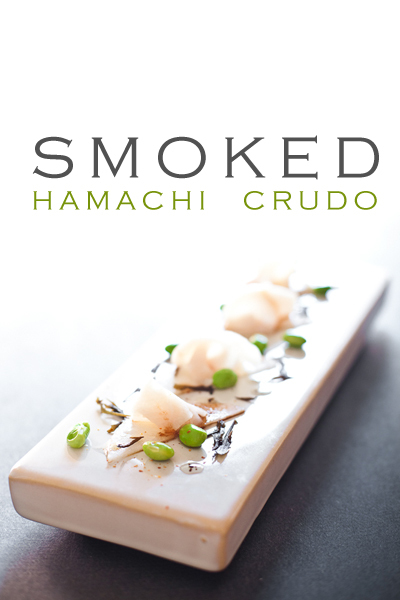 We moved on to what we present in today's Restaurant Re-creation: Smoked Hamachi Crudo. We LOVE hamachi and this dish was so incredibly clean in its flavors. Smoked fatty hamachi sat atop of thinly sliced Asian pear with edamame and hijiki sprinkled around. You could taste every element and not one ingredient overpowered the other. The fatty hamachi melts in your mouth with a hint of smoke, while the Asian pear lent its crunchy texture and sweetness. I especially love the hijiki as it brought a taste of the ocean, salty and briny. Seriously clean. I wouldn't call this a bold flavored dish, but it was one of those dishes that may have marred the rest of our meal because it was all we could think about. Jared started out with a beautiful piece of sashimi grade hamachi belly (yellowtail) we picked up from Mitsuwa. It took a lot of restraint for us to not eat it right away. He thought he'd use the same cold smoke method we used from the previous smoked tuna post. But instead of walnuts, he wanted to use tea leaves for a cleaner flavor. On the first pass, he smoked some oolong tea thinking it would result in a nice strong tea aroma. However it ended up giving us more of a woody char. He tried again with jasmine tea, and it gave us a great sweet smoke so we went with it. Jasmine Tea Smoked Hamachi; recognize this smoke technique from our smoked tuna post? 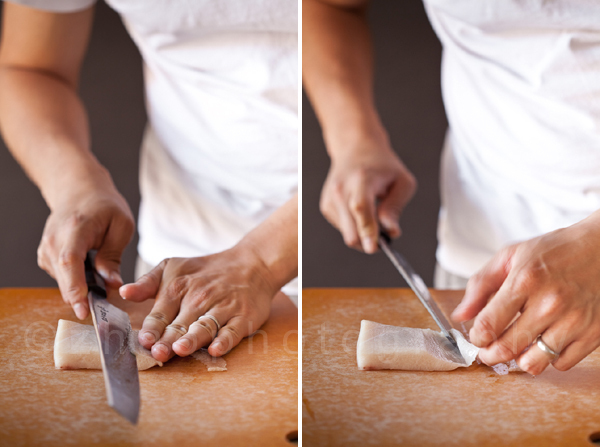 Jared then thinly sliced the hamachi (he'll use any excuse to break out this knife!). Next up is the Asian pear. And finally he put the plate together, laying down the sliced asian pears, flowering the hamachi, scattering blanched edamame and rehydrated hijiki around the plate, lightly drizzling the ponzu + olive oil mixture and finally lightly sprinkling the togarashi. The plating was also a direct copy from GT Fish and Oyster! Turn the heat to low and slowly roast the tea leaves until it starts to smoke. Once the dome is filled with smoke, quickly transfer the lid and cup the hamachi. As a reference, please refer to the "In the mood for tuna" video. In a small pot, add the dried hijiki to the dashi stock. Add a pinch of salt and let it simmer on low until the hijiki is re-hydrated. About 10 mins or so. In another pot, bring water to boil and and add a tablespoon of salt. Blanch the edamame for a few minutes and place it under cold running water to stop the cooking process. Remove the shells if necessary. To plate, place the Asian pear on the bottom of the plate. Scattered the edamame and hijiki around the plate. Not to discount the rest of our meal but we also had the following: shrimp and foie terrine, boulliabaise, brandade croquettes, lobster mac and cheese, carrot cake, strawberry shortcake. Overall, this was a truly solid meal and we'll definitely be back again.